Our neighboring planets may have the answer to this question. Scientists have already identified ice caps on Mars and what appear to be enormous oceans underneath the ice of Jupiter's moons. The atmosphere on Venus appeared harsh and insupportable of life, composed of a toxic atmosphere and oceans of acid - until scientists concluded that Earth's atmosphere was eerily similar billions of years ago. An extraterrestrial colony, in some form, may already exist, just awaiting discovery. But the greatest impediment to such an important scientific discovery may not be technological, but political. No scientific endeavor can be launched without a budget, and matters of money are within the arena of politicians. 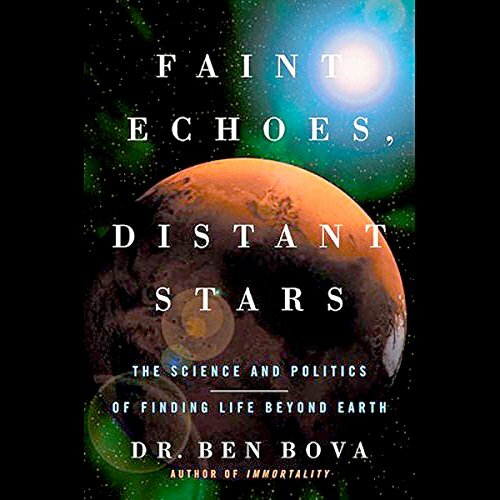 Dr. Ben Bova explores some of the key players and the arguments waged in a debate of both scientific and cultural priorities, showing the emotions, the controversy, and the egos involved in arguably the most important scientific pursuit ever begun. ©2005 Ben Bova (P)2009 Audible, Inc.
Good info but out of date. The first few chapters of this book provide some basic science. Mostly it is stuff that one would learn in a first year community college class. This book deals primarily with the politics of 2003. It is woefully out of date with current policies, politics, funding, and discoveries. The book is well written and well read. If you want to know the basics behind a SETI project I do suggest you read this book. This is a story that needs to penetrate the world's psyche! As a society, we need to remain curious enough to expend resources on questions like this.....Good Job, Ben!!!! while the book was interesting, a lot of the subject material and the missions discussed are in the books 'future'. As the book was published in 2003, some of the future missions it mentions (New Horizons mission to Pluto, the Rosette mission etc) have already concluded, and this gives the book a 'dated feel'.. this is unfortunate, as otherwise the content is very interesting.